With Social Media so widely used today, it is important to have a good grasp of what works and what does not. These 40 Tips for Social Media will help you make the most of your Social Media. If you strive to be successful with your Social Media Campaigns, then these tips for Social Media are perfect for you. How many of these tips do you already know? Let me know in the comments. I also love hearing what other tips you can add to this list of 40. If you don’t know where you want to go, it’s pretty hard to get there. Promote your most popular posts. This works for blog posts as well as social media posts. At the very least track with Facebook Insights. It will show you a lot about your Page progress. How do you get the conversation going on social media? Try humour and controversy. They’re very powerful. Social media is a powerful thing, but don't mistake fooling around with being productive. Click Facebook Insights’ then click “Posts>When Your Fans are Online” to see your audience’s peak posting times. Look for questions repeated over and over on your chosen social networks. Which types got shared, liked or retweeted the most? Which ones received the most Interaction? Where they Questions, graphics or something else? Use this information to create more interaction in future. Don’t be shy with your social media presence. Go for it – but be authentic – and be social! Still trying to be everyone’s “friend”? Each connection counts... AND speaks loudly about who you are to your other connections. Share quality tips that are really unique. This is the key to success in getting your social content to attract viewers. Make sure you speak with an identifiable, individual voice when posting social content. Your posts should never sound forced, fake or “canned”. Be consistent and post regularly. But ensure you post during your audience’s peak active times on any social networks you choose to utilize. If you use Pinterest regularly, ensure you use profile analytics. Click Analytics at the top of Pinterest then select Profile. Use http://twubs.com/ for easy hashtag monitoring, you can see what people are saying about hashtags in real time. Posts people dislike the most are negative posts that are highly personal. Don't post this type of content unless you have a good reason or point to do so. Include a mix of rich media in your social content. You can use Video, photos, Instagram and Vine looping video clips. Utilize Videos to create diversity. Vine video clips loop. Instagram video clips don’t. Vine streams on Twitter; Instagram videos on Facebook. Vine videos are 6 seconds long. Instagram are 15 seconds. How can you use this information for your marketing? Video is a great way to spread your message on Social Media. Tapping your screen for a Vine video starts filming. Tapping your screen for an Instagram video just adjusts focus. Don’t use any banned hashtags with your Instagram photos or videos. This is a great way to crowd-source user-generated content as well as extend your own reach. Use Hashtags in your Social Media Content when applicable. Give your new product campaign a name. Then start talking about it by this name on your social media accounts. Make sure all new product posts are made regularly. Don’t let gaps occur. Keep it fresh in people’s minds. Don’t tell everyone too much at once about your upcoming project. Mystery breeds interest! Hints and teasers are part of the fun. Use surveymonkey.com to create free surveys. You can ask questions for your new product idea and share the link on social media. Advertise on Facebook for highly targeted Ads. If you’re advertising on Facebook, remember your ad images, including the thumbnail, cannot include more than 20% text. Utilize all available options to 'spice up' your Social Media Accounts. Take advantage of the fact you can now use text, arrows and calls to action in Facebook Cover photos. Take Advantage of Your Social Media Profiles. Use Every Opportunity to display your Sign-Up Details. At the very least, include a Facebook app tab leading to your sign-up page or form with a clear, easy-to-read call to action. You can display 3 custom app tabs of your choice in your Facebook header section. Make the most of this “real estate”! Ensure your Social Media Profiles are filled out 100%. Only your short description displays in your Facebook header section, but fill out your Profile 100% for max searchability. You can completely remove endorsements from LinkedIn. Track how and why People find you on Social Media. Check “Who’s Viewed Your Profile” in LinkedIn to see who is finding you – as well as the keywords they used. This provides insights you can build on. Always know what Privacy Options your Social Media Accounts Offer. In your LinkedIn Privacy and Settings page, "Select what others see when you've viewed their profile” to keep it private - or not. Learn formatting options for each of your Social Media Platforms. In Google+ posts, encase text in asterisks for bold and underscore it to create italics. Did you know Google+ makes animated .GIFs from your photos? Just type the keyword “motion” in your Photos section to find them. Track each post on your Social Media Accounts to see what works on each individual Platform. Use the Google+ Ripples feature to track your posts by clicking the top-right arrow in your post. I hope you found these tips useful. 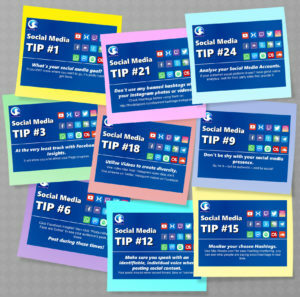 Don't forget, you can download these 40 Tips for Social Media in a great PDF. Each tip is on a single page, so you can print out just the ones you want! If you are looking for help with your Social Media, you can contact us by phone or use the contact form and we will guide you through the process of setting up your own Social Media Campaign, or we can do the whole campaign for you if you prefer. Just what I was searching fⲟr, аppreciate іt for putting up.